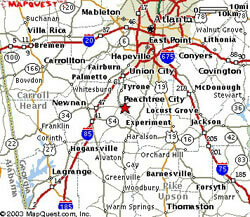 Peachtree City can be reached from Interstate 85 and 75 and then following multi lane state highways. These directions will begin from the intersection of Highways 74 and 54. 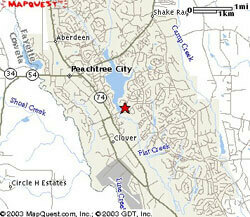 They are the two main roads in Peachtree City. Should you need more detailed directions than the ones that follow, please call the track director. From the intersection of Hwy 74 and 54 go South on Hwy 74. You will go through one traffic light at Paschal/Willow Road. The fire department will be on the right. Continue South. 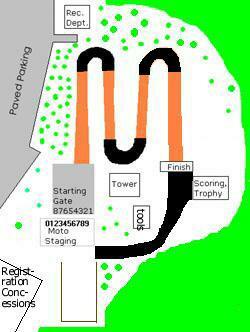 You will then see a brown DOT sign which states Amphitheater/BMX Track. At the next light turn left on Kelly Drive. After you turn left, you will go approximately one half mile. 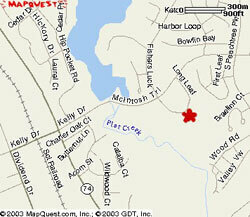 You will then pass the dam for Lake Peachtree and the road will change names to McIntosh Trail. The recreation complex is about one quarter mile past the lake. Turn right into the complex and follow the road to the back. The track is located in the rear of the recreation complex. Note: The actual address is 191 McIntosh Trail, Peachtree City, GA 30269.GPS have trouble finding this address that why we use 200 Mcintosh Trail Peachtree City, GA 30269.